We're proud to introduce a Maccaferri pickup that matches the tone quality you are used to from our Pure Mini pickups. 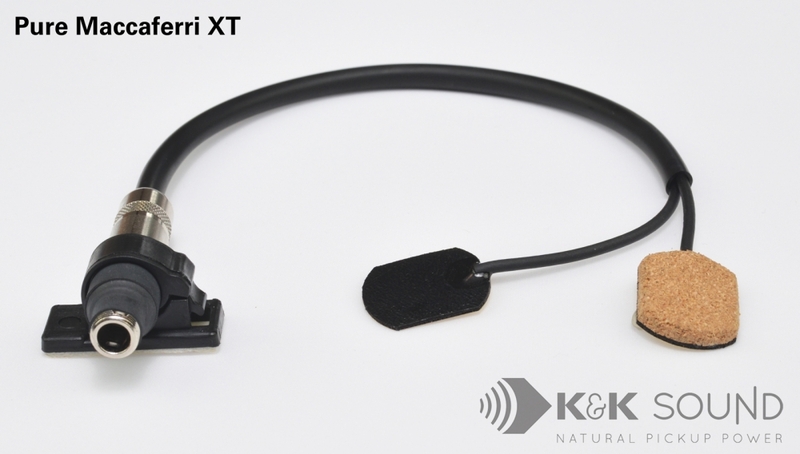 The Pure Maccaferri XT is an external pickup system that easily intalls on any type of Maccaferri guitar, oval-hole or d-hole. The twin head pickup consists of a compression-mounted element in the arch of the bridge and a soundboard transducer. With this combination, we're able to achieve a great tone quality and very impressive and substantial volume before feedback. The soundboard transducer uses a low-adhesion double-sided mounting tape, while the pickup in the arch stays in place through pressure. The jack clip is also attached with a double-sided adhesive that will not damage the finish of your guitar.